The Asylum contains some cursing, non-PC language, and male strippers. 1) Find a copy of The Asylum in bookstores or at your local library. It’s also available for Kindle, Nook, Kobo, and as an Overdrive library ebook (in some regions). Some people have had a hard time finding the Kindle edition, but it’s there. (Just search for The Asylum, not the full title). 3) Come back to the Colette blog on May 12 to talk about the book and learn which books are next. If you can’t find The Asylum, grab Doonan’s other book Eccentric Glamour instead. Some parts are a little dated (like when he rails against the fashion trends of the early 2000s). But the rest of the book is an eternally relevant and life-affirming treatise on personal style. 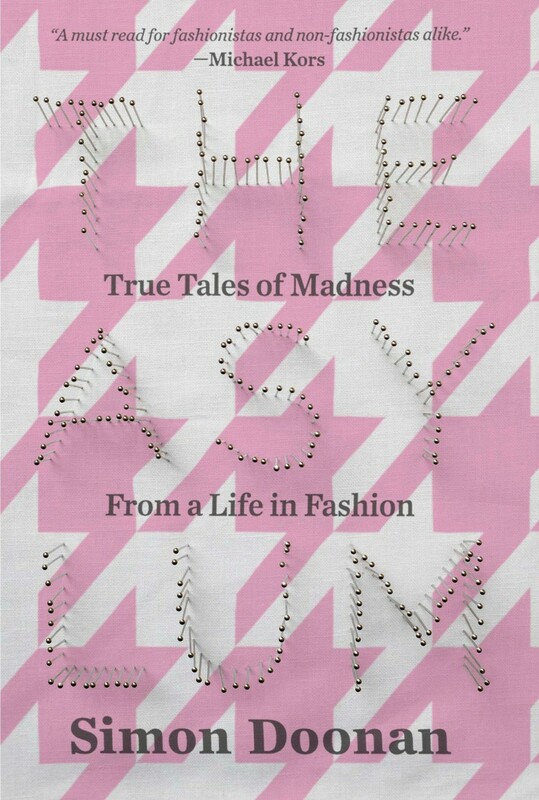 I find Simon Doonan’s books deliciously entertaining. They’re part of my personal Happiness Canon: the media I consume when I need to be jolted out of a mood. The Happiness Canon also contains the TV show 30 Rock and Terry Pratchett’s Discworld novels. Let us know in the comments below — what’s in your Happiness Canon? Thank you to everyone who participated in our March 31 discussion of Overdressed: The Shockingly High Cost of Cheap Fashion by Elizabeth L. Cline. It was a great discussion that went all over the place, from minimalism and shopping habits to the challenge of dressing growing children who need new wardrobes every year. Other Book Club readers pointed out that home sewing also creates waste, and that textile manufacture isn’t great for the environment either. JEN asked, “Is it wasteful to have an extensive wardrobe, even if it’s “me-made”?” A few people shared an excellent essay by Emily Matchar, Sorry, Etsy. That Handmade Scarf Won’t Save the World. Jen also shared a very recent podcast where Cline discusses a related issue: textile waste in the fashion industry. Is it crazy that, spurred by this book club, I’ve nearly finished everything he’s written? I’m totally smitten. That’s great! Now you can move on to the books written by his lovely husband Jonathan Adler. They’re home decor books but the philosophy is pretty similar. Also, you learn some neat stuff, like SD and JA own a 9 foot long macrame owl made of rope. It’s so heavy it takes four people to move. I’ll admit that I ended up purchasing both “Asylum” & “Eccentric Glamour” at the same time, but ultimately ended up reading “Eccentric” first. I very much feel that it’s the best entry point for Simon Doonan, since “Asylum” can wander a bit and is pretty dark at times. I don’t think I could have enjoyed “Asylum”, or have gotten through it so quickly without having read “Eccentric” first. I also read through “Beautiful People”, another fantastic book. I laughed, giggled, snerked, and cried. J’adore Simon’s wit and life experiences! I have just tried yet again to get a kindle copy of The Asylum. No luck ?. I am in Australia. Huge pity. I might try another title as suggested just to keep up with the thoughts flowing from everyone.